It was in 1932 that Cecil Kimber introduced the Magnette name to a new series of cars. The 18/ 80 was nearing the end of its useful production life and it was at the 1932 Motor Show that a new 6 cylinder car was announced, designated the 'K' Series following on in logical sequence from the ' J' types. This new model was to be an important basis for a new racing car to compete in the 1100cc Class and was powered by a 1087cc straight six engine. The chassis was of conventional MG design although the track, wheelbase and width were all increased over the previous Midgets and Magnas allowing more interior space in either open four seattouring form or four door pillarless saloon. The engine was known as the KA based closely on the Wolseley Hornet and was deemed underpowered for the long wheelbase K1 and short wheelbase K2, so very soon after these two models had gone into production a more powerful KB type engine was made available. This was put into the open tourers as they were considered to be more worthy of the extra power, whilst the KA type engine was retained for use in the more sedate saloons. The Magnette range generally were offered with a non-synchromesh 'crash' gearbox although a Wilson type pre-selector gearbox was available as an option. There was a racing model of the 'K' Series dubbed the K3 which was thought to be the real reason for the production of the entire 'K' range as Cecil Kimber could not justify the manufacture of a racing model on its own at the time. 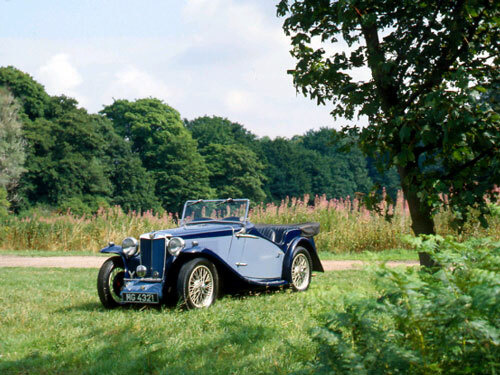 During 1933 the Magna range was updated with the introduction of the 'L' type in which was placed an engine derived from the KB Magnette power unit. This became known as the KC type with coil ignition and twin carburettors. The engine had a shorter stroke of 57mm x 71mm which was identical to the racing Midgets of the era. The 'K' Magnette was considerably more expensive than the Magna so an even more powerful engine was produced by enlarging the unit to 1271 cc and increasing the stroke thus making it a genuine top of the range model. This new engine was known as the KD type and it produced 25% more power than the original unit and was coupled to the now standard pre-selector gearbox. There was, at this time, a lot of development work going on at Abingdon, and there was huge involvement in racing also. This was reflected in a general rise in the prices of the end product which made the already expensive Magnettes even harder to sell. Although the company's expenditure was relatively modest in terms of the racing victories, the concentration of effort on this side had been at the expense of fulfilling the market needs. So in 1934 the range was reduced and the P type was introduced to replace the J2 which at that time was the mainstay of the range despite the unserviceability of the two bearing crankshaft which generally broke in two when revving the engine at peak speeds. This new Midget arrived on the market in February of that year sporting a new 3 bearing 847cc engine that was far sturdier than that used by its predecessor. In March the 'N' types were introduced to replace the Magnas and gain some standardisation and rationalisation of the range. The 'N' type Magnette was important because it was MG's first departure from the familiar standard type ladder frame chassis with the side members being wider at the rear than the front. There was also a new innovation with outrigger members mounted on 'Silentbloc' rubber bushes. These were fixed to the side and rear of the main chassis and carried the body. The 'N' or 'NA' as it was known was available with a choice of either two or four seater bodies and the previously distinctive slab type petrol tank was now disguised behind a very elegant swept tail that incorporated a semi-recessed spare wheel. Shortly after its launch two other body styles were announced by specialist coachbuilders. One was made by Allingham and this body resurrected and incorporated the previously fashionable dickey seat. A few Airline fixed-head coupes were also produced at this time, which were most attractive. It is estimated that about 12 of each model were made, making them extremely rare indeed. Also rare is the ND hybrid which was made from redundant K2 bodies fitted to the N type chassis and in similar fashion, surplus K1 pillarless saloon bodies were mated to the N type chassis to form what was known as the KN saloon. The engine used in the 'N' type was developed from the KD unit previously mentioned with a displacement of 1271 ccs and power output of 56bhp @ 5,500rpm. Modifications were fairly extensive involving the cylinder block, cylinder head, inlet manifold, oil lubrication system and clutch. These modifications saw a 25% power output increase over the KD unit and this gave the 'N' type fairly good performance. The gearbox was similar to that used in the 'L' type, being non-synchromesh and reverse gate but with different gear ratios having two low starting gears and two high ratio cruising gears. In 1935 the mechanical specification of the 'N' type was altered with a closer ratio gearbox being fitted and there were also improvements to the bodywork with a revised lowered scuttle and forward hinged doors. A slatted radiator was employed to distinguish it from the 'NA'and was similar to that used on the 18/80s and the PB. This model was configured the 'NB' by Abingdon and was in production for most of 1936 being the last of the overhead cam MGs to be produced before being finally replaced by the one and a half litre, four cylinder VA model with its pushrod overhead valve engine. There was, in 1934, a racing version of the 'N' type produced known as the 'NE'and it was specially developed for the 1934 TT race in which superchargers were banned for the first time, this was perhaps in an attempt to break MG's previous dominance of the race. Against all odds, the 'NE' won the race on handicap, being faster than all other finishers, some of them sporting four and a half litre engines. Of the six 'NE' models produced, some were used successfully throughout 1936 by the Cream Crackers Trials Team. However by 1935 the era of the small six cylinder engine was coming to a close with large capacity four cylinder engines, mounted on rubber blocks, providing far better torque characteristics. This was the end of an era for MG with rationalization on the horizon, brought in by the Nuffield organisaion which was to change the MG range dramatically.